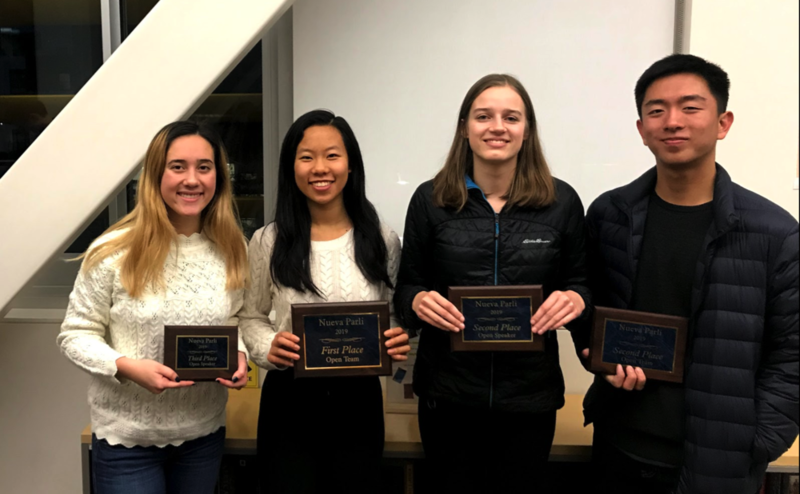 88 teams gathered at Nueva Upper School on January 13th to compete in the open and junior varsity divisions at the second annual Nueva Invitational. The tournament featured 5 preliminary rounds for the open division and the junior division, with breaks to hidden semifinals in the 5th preliminary round. The tournament allowed casual dress, a change from formal dress promoted at most tournaments. Campolindo was featured in Nueva’s closeout for the second year in a row, with Campolindo’s Shannon Bonet & Sharon Yuan co-championing with Los Altos/Campolindo’s Ryan Lee & Sophie Stankus. Last year, Bonet & Yuan closed out with teammates Kevin Deng & Krish Visht. In the semifinals round, Campolindo BY defeated El Cerrito’s Audrey Dowling and Maxime St-Jean on a 3-0 decision debating the resolution, “The United Nations should send a peacekeeping mission to the territory of the Democratic Federation of Northern Syria.” Meanwhile, Los Altos/Campolindo LS walked over teammates Los Altos’s Angelina Lue & Henry Shi. Coincidentally, Lee & Stankus were walked over by Deng & Visht in semifinals last year. Competitors were able to read a mix of technical and traditional arguments, mainly due to the “flay” nature of the judge pool, meaning both lay and flow judges were in attendance. There were 38 judges in the open pool and 18 judges in the junior pool, many being former or current debaters themselves. “The judge pool was decently flay, so pretty appreciated, especially since there were a lot of Nueva coaches,” said Cheng.